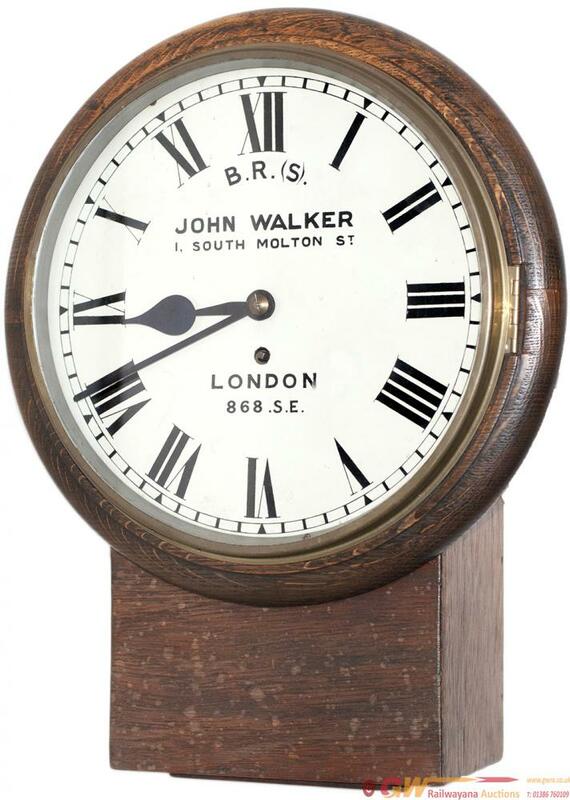 South Eastern Railway 12in dial oak cased drop dial railway clock with a chain driven English fusee movement stamped in the back SER G&B. The case is in ex railway condition and the back box is stamped 868.SE. The dial is in lightly cleaned original condition and is screen printed JOHN WALKER 1 SOUTH MOLTON ST LONDON and lettered B.R. (S) 868.S.E. In working condition complete with pendulum which is stamped 868 and key. The Southern Railway records show this clock as last being in use at Virginia Water Platform and previously at Charing Cross Main Line Booking Office.